Prisoner Trying To ESCAPE Gets STUCK In The Bars Of His Cell! He was presumably hoping to kick of 2010 a free man on the run but it seems he forgot to meticulously plan his escape route. 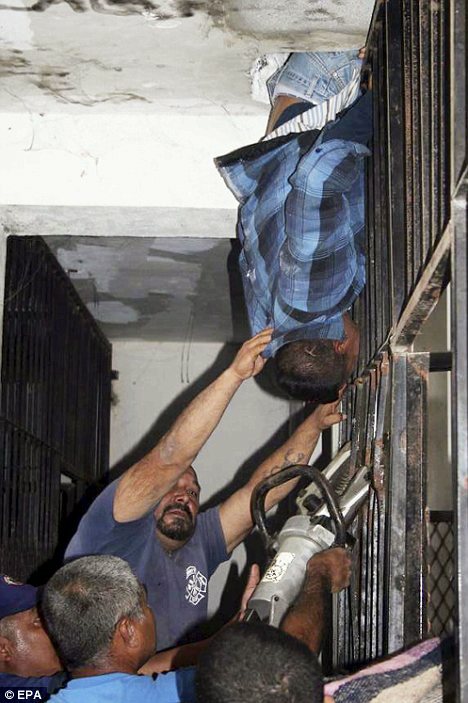 Prisoner Roberto Carrillo attempted to flee his cell in a Mexican jail in Valle Hermoso on New Year's Eve. The 42-year-old tried to squeeze himself between the gap between the roof of the prison and the bars of his cell. But instead of sneaking through, he ended up completely stuck and hanging upside down. He was forced to call for help and laughing guards came to his aid and cut him free using a chain saw - before locking him up once again.